A Movie A Week #23: Up In The Air | I Review Too . . .
← Everybody Shut Up: Have Today’s Movie Fans Become Spoilt Brats? Jason Reitman’s follow up to 2007’s Juno sees the director aim slightly higher than teenage indie comedy. 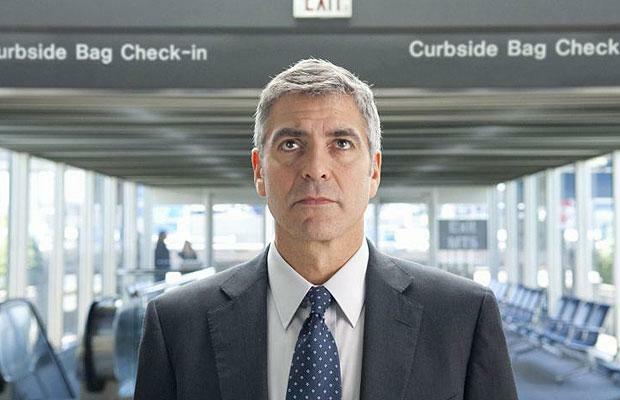 With Up In The Air, he proves that he can handle adults just as easily as sassy, knocked-up teens, whilst keeping his alternative rom-com charm. George Clooney may have been no stranger to the big screen in 2009 (starring in three films during November and December alone) but no performance is as intimate or compelling as Ryan Bingham. Makes you wonder if Clooney – a self confessed ladies man with no intention of settling down anytime soon – is aware of the comparison? But maybe that’s just what makes him so interesting to watch. Giving Self Help talks on the dangers of life commitments, Ryan asks audiences to cram their life into a backpack; their possessions, even their relationships – all to re-enforce his frugal life philosophy. As he eloquently puts it: “The slower we move the faster we die,” and as such Ryan has an inability to stay in one place for too long. When Natalie, a young professional with her eye on the prize but her heart on her sleeve suggests firing people via webcam, thus making travelling redundant, Ryan’s cushy existence is thrown, well, up in the air. Battling his corner, he attempts to prove to Natalie that his face-to-face technique is crucial by inviting her on a firing-spree, all the while aiming for his coveted goal of ten million Frequent Flyer Miles, an achievement only seven other people have accomplished. These are the things that Ryan finds important and he’s confident that he knows what he wants. At least he thinks he does. When fellow ‘professional traveller’ Alex (Vera Farmiga) arrives on the scene, it becomes clear that Ryan is more confused than he lets on. Achieving his goals only to question whether they’re what he really wanted and with young Natalie vocally championing the importance of love and companionship, he soon beings to question his precious philosophy on life. At its core, Up In The Air is a study of relationships; how they define you, how they consume you and how they can save your life, even if they do tend to ground you in one place. Reitman proves once again that he is one of today’s best indie filmmakers by expertly walking the tightrope of emotional comedy and thought provoking substance. Meanwhile his cast are all on top form. Jason Bateman dons his serious face as Ryan’s hard-nosed boss and you can no doubt expect to see a lot more of Anna Kendrick in the future. Funny faces like Zack Galifianakis, J.K. Simmons and Danny McBride appear briefly as Ryan’s unfortunate fire-ees, cleverly mixed with what appear to be real life testimonials from the recently unemployed, however they all carry the same message: everybody needs a co-pilot. Originally published on IReviewToo.Blogspot.com on 11th January 2010.